Go Green and Save Green for Earth Day 2019! Earth Day is April 22 and in honor of Mother Earth, we're making it more affordable than ever to go solar. 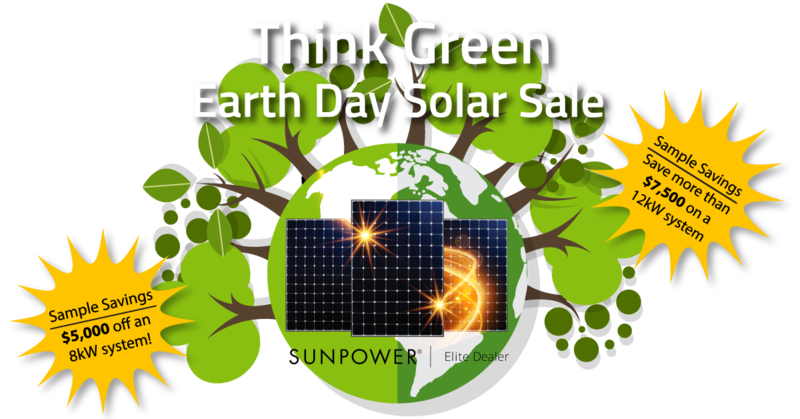 For a limited time, we've secured special pricing on a limited quantity of SunPower's most popular panels. * Reduce your carbon footprint while saving thousands! * The bigger the system, the more you save. *Discount Package Terms: This offer is available only on select SunPower panels only, and only while supplies last. Example savings packages shown above will vary depending on individual panel choices. Labor, inverter, installation hardware and other customized components will be assessed separately. March Madness discount pricing may not be applied to existing active projects or past purchases. Tax credits only apply to purchased systems (cash or financed). Buyer does not retain tax credits on leased systems. © Copyright 2018. Sun Valley Solar Solutions. All Rights Reserved.